A perennial from open grassland areas, Eryngium ovinum is commonly called “Blue Devil” and this a great plant for the dry garden. The flowers are a steely blue and have a distinct ‘spikes’ appearance. Being long lasting these interesting blooms add interest to the garden right through summer. The flowers not only add interest to the garden they can can also be used as cut flowers and if you wish, in dried arrangements. The overall look of the plant is ‘Spikey’ and this includes the foliage. 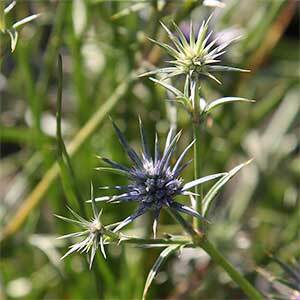 You can also grow Eryngium ovinum in deep containers if desired where it makes an interesting specimen plant. Or perhaps grow it in the succulent garden where it adds a little height and contrast. In a sunny position and a well drained soil this is an easy care plant. It is both frost and drought tolerant, and requires only to be pruned back after the foliage has died back in autumn. Fairly easy from seed, and as this is a fairly long lived perennial once established it will bounce back from dormancy each spring. Spread to around 20 cm. Eryngium ovinum is available for sale from the following participating nurseries.